Flow directions are inferred from potentiometric contour maps of the carbonate aquifers in Nevada in Prudic and others (1995) and Thomas and others (1986). 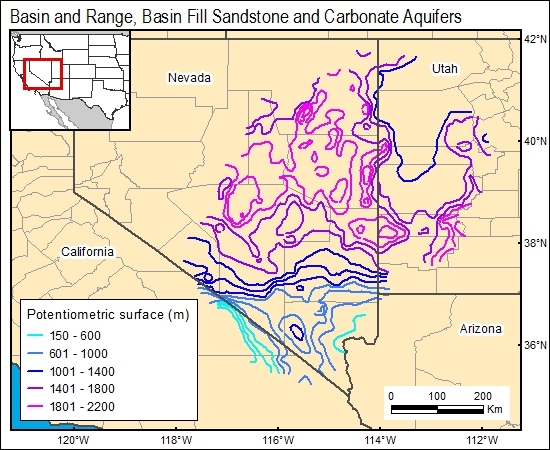 Arrows indicating preferred ground-water flow directions in Tertiary basin-fill sandstones in northwestern Arizona and southwestern Utah are shown in Robson (1996). Robson, S. G., 1996, Ground water atlas of the United States, Segment 2: Colorado, Nevada, and New Mexico: U.S. Geological Survey Atlas. Thomas, J. M., Mason, J. L., and Crabtree, J. D., 1986, Ground-water levels in the Great Basin region of Nevada, Utah, and adjacent states: U.S. Geological Survey Hydrologic Investigations Atlas HA-694-B, 2 sheets.